"ATSC" redirects here. For other uses, see ATSC (disambiguation). Advanced Television Systems Committee (ATSC) standards are a set of standards for digital television transmission over terrestrial, cable, and satellite networks. It is largely a replacement for the analog NTSC standard, and like that standard, used mostly in the United States, Mexico and Canada. Other former users of NTSC, like Japan, have not used ATSC during their digital television transition because they adopted their own system called ISDB. The ATSC standards were developed in the early 1990s by the Grand Alliance, a consortium of electronics and telecommunications companies that assembled to develop a specification for what is now known as HDTV. The standard is now administered by the Advanced Television Systems Committee. The standard includes a number of patented elements, and licensing is required for devices that use these parts of the standard. Key among these is the 8VSB modulation system used for over-the-air broadcasts. ATSC includes two primary high definition video formats, 1080i and 720p. It also includes standard-definition formats, although initially only HDTV services were launched in the digital format. ATSC can carry multiple channels of information on a single stream, and it is common for there to be a single high-definition signal and several standard-definition signals carried on a single 6 MHz (former NTSC) channel allocation. The high-definition television standards defined by the ATSC produce wide screen 16:9 images up to 1920×1080 pixels in size – more than six times the display resolution of the earlier standard. However, many different image sizes are also supported. The reduced bandwidth requirements of lower-resolution images allow up to six standard-definition "subchannels" to be broadcast on a single 6 MHz TV channel. ATSC standards are marked A/x (x is the standard number) and can be downloaded for free from the ATSC's website at ATSC.org. ATSC Standard A/53, which implemented the system developed by the Grand Alliance, was published in 1995; the standard was adopted by the Federal Communications Commission in the United States in 1996. It was revised in 2009. ATSC Standard A/72 was approved in 2008 and introduces H.264/AVC video coding to the ATSC system. ATSC supports 5.1-channel surround sound using Dolby Digital's AC-3 format. Numerous auxiliary datacasting services can also be provided. Many aspects of ATSC are patented, including elements of the MPEG video coding, the AC-3 audio coding, and the 8VSB modulation. The cost of patent licensing, estimated at up to $50 per digital TV receiver, has prompted complaints by manufacturers. As with other systems, ATSC depends on numerous interwoven standards, e.g. the EIA-708 standard for digital closed captioning, leading to variations in implementation. ATSC replaced much of the analog NTSC television system in the United States on June 12, 2009, on August 31, 2011 in Canada, on December 31, 2012 in South Korea, and on December 31, 2015 in Mexico. Broadcasters who used ATSC and wanted to retain an analog signal were temporarily forced to broadcast on two separate channels, as the ATSC system requires the use of an entire separate channel. Channel numbers in ATSC do not correspond to RF frequency ranges, as they did with analog television. Instead, virtual channels, sent as part of the metadata along with the program(s), allow channel numbers to be remapped from their physical RF channel to any other number 1 to 99, so that ATSC stations can either be associated with the related NTSC channel numbers, or all stations on a network can use the same number. There is also a standard for distributed transmission systems (DTx), a form of single-frequency network which allows for the synchronised operation of multiple on-channel booster stations. Dolby Digital AC-3 is used as the audio codec, though it was standardized as A/52 by the ATSC. It allows the transport of up to five channels of sound with a sixth channel for low-frequency effects (the so-called "5.1" configuration). In contrast, Japanese ISDB HDTV broadcasts use MPEG's Advanced Audio Coding (AAC) as the audio codec, which also allows 5.1 audio output. DVB (see below) allows both. MPEG-2 audio was a contender for the ATSC standard during the DTV "Grand Alliance" shootout, but lost out to Dolby AC-3. The Grand Alliance issued a statement finding the MPEG-2 system to be "essentially equivalent" to Dolby, but only after the Dolby selection had been made. Later, a story emerged that MIT had entered into an agreement with Dolby whereupon the university would be awarded a large sum of money if the MPEG-2 system was rejected. Dolby also offered an incentive for Zenith to switch their vote (which they did); however, it is unknown whether they accepted the offer. The ATSC system supports a number of different display resolutions, aspect ratios, and frame rates. The formats are listed here by resolution, form of scanning (progressive or interlaced), and number of frames (or fields) per second (see also the TV resolution overview at the end of this article). For transport, ATSC uses the MPEG systems specification, known as an MPEG transport stream, to encapsulate data, subject to certain constraints. ATSC uses 188-byte MPEG transport stream packets to carry data. Before decoding of audio and video takes place, the receiver must demodulate and apply error correction to the signal. Then, the transport stream may be demultiplexed into its constituent streams. There are four basic display sizes for ATSC, generally known by referring to the number of lines of the picture height. NTSC and PAL image sizes are smallest, with a width of 720 (or 704) and a height of 480 or 576 lines. The third size is HDTV images that have 720 scan lines in height and are 1280 pixels wide. The largest size has 1080 lines high and 1920 pixels wide. 1080-line video is actually encoded with 1920×1088 pixel frames, but the last eight lines are discarded prior to display. This is due to a restriction of the MPEG-2 video format, which requires the height of the picture in luma samples (i.e. pixels) to be divisible by 16. The lower resolutions can operate either in progressive scan or interlaced mode, but not the largest picture sizes. The 1080-line system does not support progressive images at the highest frame rates of 50, 59.94 or 60 frames per second, because such technology was seen as too advanced at the time. The standard also requires 720-line video be progressive scan, since that provides better picture quality than interlaced scan at a given frame rate, and there was no legacy use of interlaced scan for that format. The result is that the combination of maximum frame rate and picture size results in the same maximum number of samples per second for both the 1080-line interlaced format and the 720-line format, as 1980*1080*30=64152000 is equal (?!?) to 1280*720*60=55296000. A similar equality relationship applies for 576 lines at 25 frame per second versus 480 lines at 30 frames per second. A terrestrial (over-the-air) transmission carries 19.39 megabits of data per second (a fluctuating bandwidth of about 18.3 Mbit/s left after overhead such as error correction, program guide, closed captioning, etc. ), compared to a maximum possible MPEG-2 bitrate of 10.08 Mbit/s (7 Mbit/s typical) allowed in the DVD standard and 48 Mbit/s (36 Mbit/s typical) allowed in the Blu-ray disc standard. Although the ATSC A/53 standard limits MPEG-2 transmission to the formats listed below (with integer frame rates paired with 1000/1001-rate versions), the U.S. Federal Communications Commission declined to mandate that television stations obey this part of the ATSC's standard. In theory, television stations in the U.S. are free to choose any resolution, aspect ratio, and frame/field rate, within the limits of Main Profile @ High Level. Many stations do go outside the bounds of the ATSC specification by using other resolutions – for example, 352 x 480 or 720 x 480. "EDTV" displays can reproduce progressive scan content and frequently have a 16:9 wide screen format. Such resolutions are 704×480 or 720×480 in NTSC and 720×576 in PAL, allowing 60 progressive frames per second in NTSC or 50 in PAL. ATSC also supports PAL frame rates and resolutions which are defined in ATSC A/63 standard. The maximum bit rate value in the sequence header of the MPEG-2 video stream is 19.4 Mbit/s for broadcast television, and 38.8 Mbit/s for the "high data rate" mode (e.g., cable television). The actual MPEG-2 video bit rate will be lower, since the MPEG-2 video stream must fit inside a transport stream. The amount of MPEG-2 stream buffer required at the decoder (the vbv_buffer_size_value) must be less than or equal to 999,424 bytes. In most cases, the transmitter can't start sending a coded image until within a half-second of when it's to be decoded (vbv_delay less than or equal to 45000 90-kHz clock increments). The stream must include colorimetry information (gamma curve, the precise RGB colors used, and the relationship between RGB and the coded YCbCr). The video must be 4:2:0 (chrominance resolution must be 1/2 of luma horizontal resolution and 1/2 of luma vertical resolution). The ATSC specification and MPEG-2 allow the use of progressive frames coded within an interlaced video sequence. For example, NBC stations transmit a 1080i60 video sequence, meaning the formal output of the MPEG-2 decoding process is sixty 540-line fields per second. However, for prime-time television shows, those 60 fields can be coded using 24 progressive frames as a base – actually, an 1080p24 video stream (a sequence of 24 progressive frames per second) is transmitted, and MPEG-2 metadata instructs the decoder to interlace these fields and perform 3:2 pulldown before display, as in soft telecine. The ATSC specification also allows 1080p30 and 1080p24 MPEG-2 sequences, however they are not used in practice, because broadcasters want to be able to switch between 60 Hz interlaced (news), 30 Hz progressive or PsF (soap operas), and 24 Hz progressive (prime-time) content without ending the 1080i60 MPEG-2 sequence. The 1080-line formats are encoded with 1920 × 1088 pixel luma matrices and 960 × 540 chroma matrices, but the last 8 lines are discarded by the MPEG-2 decoding and display process. The file extension ".TS" stands for "transport stream", which is a media container format. It may contain a number of streams of audio or video content multiplexed within the transport stream. Transport streams are designed with synchronization and recovery in mind for potentially lossy distribution (such as over-the-air ATSC broadcast) in order to continue a media stream with minimal interruption in the face of data loss in transmission. When an over-the-air ATSC signal is captured to a file via hardware/software the resulting file is often in a .TS file format. ATSC signals are designed to use the same 6 MHz bandwidth as analog NTSC television channels (the interference requirements of A/53 DTV standards with adjacent NTSC or other DTV channels are very strict). Once the digital video and audio signals have been compressed and multiplexed, the transport stream can be modulated in different ways depending on the method of transmission. Terrestrial (local) broadcasters use 8VSB modulation that can transfer at a maximum rate of 19.39 Mbit/s, sufficient to carry several video and audio programs and metadata. Cable television stations can generally operate at a higher signal-to-noise ratio and can use either the 16VSB as defined in ATSC or the 256-QAM defined in SCTE, to achieve a throughput of 38.78 Mbit/s, using the same 6 MHz channel. The proposals for modulation schemes for digital television were developed when cable operators carried standard-resolution video as uncompressed analog signals. In recent years, cable operators have become accustomed to compressing standard-resolution video for digital cable systems, making it harder to find duplicate 6 MHz channels for local broadcasters on uncompressed "basic" cable. Currently, the Federal Communications Commission requires cable operators in the United States to carry the analog or digital transmission of a terrestrial broadcaster (but not both), when so requested by the broadcaster (the "must-carry rule"). The Canadian Radio-television and Telecommunications Commission in Canada does not have similar rules in force with respect to carrying ATSC signals. However, cable operators have still been slow to add ATSC channels to their lineups for legal, regulatory, and plant & equipment related reasons. One key technical and regulatory issue is the modulation scheme used on the cable: cable operators in the U.S. (and to a lesser extent Canada) can determine their own method of modulation for their plants. Multiple standards bodies exist in the industry: the SCTE defined 256-QAM as a modulation scheme for cable in a cable industry standard, ANSI/SCTE 07 2006: Digital Transmission Standard For Cable Television. Consequently, most U.S. and Canadian cable operators seeking additional capacity on the cable system have moved to 256-QAM from the 64-QAM modulation used in their plant, in preference to the 16VSB standard originally proposed by ATSC. Over time 256-QAM is expected to be included in the ATSC standard. There is also a standard for transmitting ATSC via satellite; however, this is only used by TV networks. Very few teleports outside the U.S. support the ATSC satellite transmission standard, but teleport support for the standard is improving. The ATSC satellite transmission system is not used for direct-broadcast satellite systems; in the U.S. and Canada these have long used either DVB-S (in standard or modified form) or a proprietary system such as DSS or DigiCipher 2. ATSC coexists with the DVB-T standard, and with ISDB-T. A similar standard called ADTB-T was developed for use as part of China's new DMB-T/H dual standard. While China has officially chosen a dual standard, there is no requirement that a receiver work with both standards and there is no support for the ADTB modulation from broadcasters or equipment and receiver manufacturers. For compatibility with material from various regions and sources, ATSC supports the 480i video format used in the NTSC analog system (480 lines, approximately 60 fields or 30 frames per second), 576i formats used in most PAL regions (576 lines, 50 fields or 25 frames per second), and 24 frames-per-second formats used in film. While the ATSC system has been criticized as being complicated and expensive to implement and use, both broadcasting and receiving equipment are now comparable in cost with that of DVB. The ATSC signal is more susceptible to changes in radio propagation conditions than DVB-T and ISDB-T. It also lacks true hierarchical modulation, which would allow the SDTV part of an HDTV signal (or the audio portion of a television program) to be received uninterrupted even in fringe areas where signal strength is low. For this reason, an additional modulation mode, enhanced-VSB (E-VSB) has been introduced, allowing for a similar benefit. In spite of ATSC's fixed transmission mode, it is still a robust signal under various conditions. 8VSB was chosen over COFDM in part because many areas are rural and have a much lower population density, thereby requiring larger transmitters and resulting in large fringe areas. In these areas, 8VSB was shown to perform better than other systems. COFDM is used in both DVB-T and ISDB-T, and for 1seg, as well as DVB-H and HD Radio in the United States. In metropolitan areas, where population density is highest, COFDM is said to be better at handling multipath propagation. While ATSC is also incapable of true single-frequency network (SFN) operation, the distributed transmission mode, using multiple synchronized on-channel transmitters, has been shown to improve reception under similar conditions. Thus, it may not require more spectrum allocation than DVB-T using SFNs. A comparison study found that ISDB-T and DVB-T performed similarly, and that both were outperformed by DVB-T2. Mobile reception of digital stations using ATSC has, until 2008, been difficult to impossible, especially when moving at vehicular speeds. To overcome this, there are several proposed systems that report improved mobile reception: Samsung/Rhode & Schwarz's A-VSB, Harris/LG's MPH, and a recent proposal from Thomson/Micronas; all of these systems have been submitted as candidates for a new ATSC standard, ATSC-M/H. After one year of standardization, the solution merged between Samsung's AVSB and LGE's MPH technology has been adopted and would have been deployed in 2009. This is in addition to other standards like the now-defunct MediaFLO, and worldwide open standards such as DVB-H and T-DMB. Like DVB-H and ISDB 1seg, the proposed ATSC mobile standards are backward-compatible with existing tuners, despite being added to the standard well after the original standard was in wide use. Mobile reception of some stations will still be more difficult, because 18 UHF channels in the U.S. have been removed from TV service, forcing some broadcasters to stay on VHF. This band requires larger antennas for reception, and is more prone to electromagnetic interference from engines and rapidly changing multipath conditions. ATSC 2.0 is a major new revision of the standard which will be backward compatible with ATSC 1.0. The standard will allow interactive and hybrid television technologies by connecting the TV with the Internet services and allowing interactive elements into the broadcast stream. Other features include advanced video compression, audience measurement, targeted advertising, enhanced programming guides, video on demand services, and the ability to store information on new receivers, including Non-realtime (NRT) content. ATSC 2.0 was never actually launched, as it was essentially outdated before it could be launched. All of the changes that were a part of the ATSC 2.0 revision were adopted into ATSC 3.0. ATSC 3.0 will provide even more services to the viewer and increased bandwidth efficiency and compression performance, which requires breaking backwards compatibility with the current version. On November 17, 2017 the FCC voted 3-2 in favor of authorizing voluntary deployments of ATSC 3.0, and issued a Report and Order to that effect. ATSC 3.0 broadcasts and receivers are expected to emerge within the next decade. LG Electronics tested the standard with 4K on February 23, 2016. With the test considered a success, South Korea announced that ATSC 3.0 broadcasts would start in February 2017. On March 28, 2016, the Bootstrap component of ATSC 3.0 (System Discovery and Signalling) was upgraded from candidate standard to finalized standard. On June 29, 2016, NBC affiliate WRAL-TV in Raleigh, North Carolina, a station known for its pioneering roles in testing the original DTV standards, launched an experimental ATSC 3.0 channel carrying the station's programming in 1080p, as well as a 4K demo loop. ATSC 3.0's multiple layers. 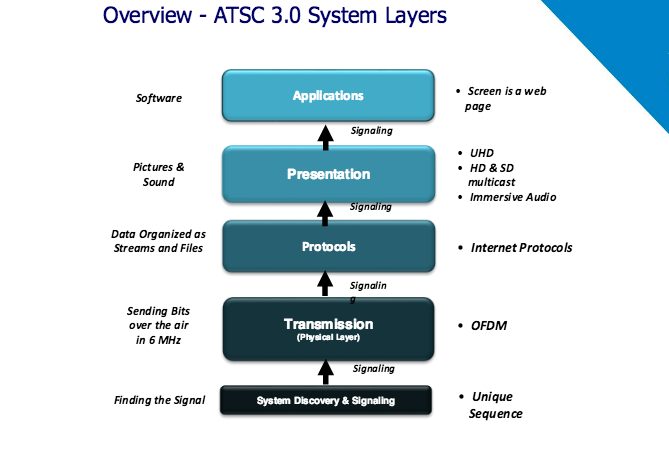 The standards within ATSC 3.0 are rolled into each of the layers. Bahamas plans for transition to ATSC standards were officially announced on December 14, 2011; national public broadcaster ZNS-TV announced it would be upgrading to ATSC digital television with mobile DTV capabilities, in line with its neighbors, the United States and Puerto Rico. Canada switched to ATSC on August 31, 2011 in provincial/territorial capitals and locations with 300,000 or more people; expected to continue broadcasting analog over-the-air television signals in 22 markets until August 31, 2012. As of 2017, many smaller towns and repeater stations still transmit in NTSC, but many UHF stations have been ordered by the government (in June 2017) to vacate the signal space, to free it up for wireless users. These stations have until June 2022 to shut off their UHF transmitters. Note this will still leave some NTSC transmissions in Canada for the foreseeable future. Dominican Republic plans announced August 10, 2010; transition complete by September 24, 2015. Mexico plans announced July 2, 2004, started conversion in 2013 full transition was scheduled for December 31, 2015, but due to technical and economic issues for some transmitters, the full transition was extended to December 31, 2016. United States switched to ATSC on June 12, 2009, excluding LPTV stations and translators which they are expected to shut down by July 13, 2021 due to economic concerns with a spectrum auction for Digital signals on LPTV and translators. Class A Stations went to Digital on September 1, 2015. South Korea completed terrestrial transition on December 31, 2012. Allows analog broadcasts on its northern border in order to be received in North Korea. Analog cable is yet to be switched off. 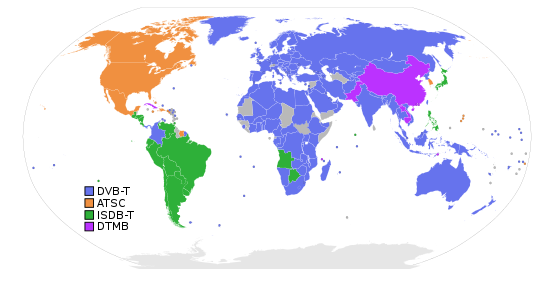 Some United States territories in the Pacific switched to ATSC on June 12, 2009, excluding LPTV stations; transition complete by March 29, 2016. ^ "TV makers to fight royalties". www.chinadaily.com.cn. Archived from the original on March 16, 2018. Retrieved March 16, 2018. ^ "Best Buy Exits the Analog TV Business, Outlines Plans to Help With Digital Broadcast Transition". businesswire.com. Archived from the original on March 16, 2018. Retrieved March 16, 2018. ^ "Congress delays DTV switch". February 4, 2009. Archived from the original on August 15, 2009. Retrieved March 16, 2018 – via Christian Science Monitor. ^ a b "DOF - Diario Oficial de la Federación". dof.gob.mx. Archived from the original on January 21, 2018. Retrieved March 16, 2018. ^ Nick (October 16, 2008). "ATSC vs DVB for North American amateurs". nsayer.blogspot.com. Archived from the original on March 16, 2018. Retrieved March 16, 2018. ^ 2013_electronic.indd Archived May 9, 2013, at the Wayback Machine. (PDF) . Retrieved on May 11, 2014. ^ George Winslow. "With ATSC 2.0, Broadcasting Gets Facelift Archived March 1, 2013, at the Wayback Machine". Broadcasting & Cable, June 6, 2011. ^ "A/103:2012, Non-Real-Time Content Delivery" (PDF). atsc.org. Archived (PDF) from the original on April 5, 2015. Retrieved March 16, 2018. ^ "FCC Authorizes Next Gen TV Broadcast Standard". Federal Communications Commission. Archived from the original on December 1, 2017. Retrieved November 18, 2017. ^ Tribbey, Chris (March 7, 2016). "ATSC 3.0 Passes Key Test, But Is It Ready to Graduate?". Broadcasting & Cable: 16–17. ^ "First Element of ATSC 3.0 Approved for Standard". tvtechnology.com. Archived from the original on March 2, 2017. Retrieved March 16, 2018. ^ "WRAL Launches ATSC 3.0 Service". TVNewsCheck. Archived from the original on November 17, 2017. Retrieved June 29, 2016. ^ Bahamas national TV to get multi-million dollar digital upgrade – video Archived April 13, 2014, at the Wayback Machine. The Bahamas Investor. Retrieved on May 11, 2014. ^ "CRTC allows CBC to continue broadcasting analog television signals in 22 markets until August 2012". News Releases. Canadian Radio-television and Telecommunications Commission. August 16, 2011. Archived from the original on May 29, 2013. Retrieved June 4, 2013. ^ "Analog TV users will soon see fewer stations | Toronto Star". thestar.com. Archived from the original on August 2, 2017. Retrieved July 22, 2017. ^ Hester, Lisa (July 6, 2004). "Mexico To Adopt The ATSC DTV Standard". Advanced Television Systems Committee. Archived from the original on June 6, 2014. Retrieved June 4, 2013. On July 2 the Government of Mexico formally adopted the ATSC Digital Television (DTV) Standard for digital terrestrial television broadcasting. ^ Dibble, Sandra (May 30, 2013). "New turn for Tijuana's transition to digital broadcasting". San Diego Union-Tribune. Archived from the original on September 6, 2013. Retrieved June 4, 2013. ^ "N. Korea in the process of introducing digital TV broadcasting". Yonhap News Agency. March 19, 2013. Archived from the original on October 1, 2013. Retrieved June 4, 2013. ^ "North Korean television sets still receive South Korean signals". News Focus International. Archived from the original on June 14, 2015. Retrieved July 12, 2015. Joel Brinkley (1998), Defining Vision: The Battle for the Future of Television, New York: Harcourt Brace. This page was last edited on 9 April 2019, at 04:15 (UTC).